Manx National Heritage have kindly allowed the Creative Network to pop-up in this iconic and historic building for the 2019 Festival. 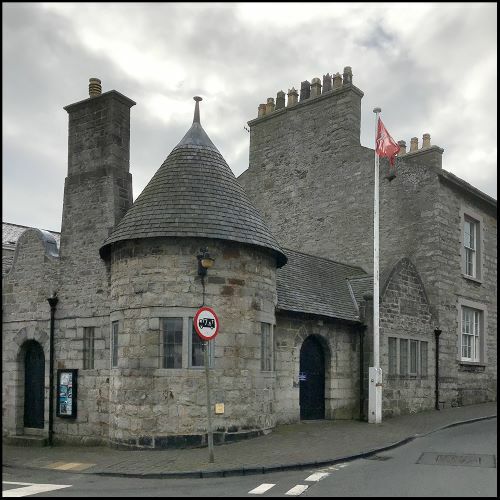 Designed by M.H Ballie Scott and built in 1901, the old police station is one of the most well known and appreciated architectural features of the ancient capital. Join Network artists including Maureen Kennaugh, who will be demonstrating her machine embroidery techniques, Karolina Pawlowska, as she paints live from the cells, and Eve Adams with her folklore and wildlife inspired illustrations and mixed media work. See new works and installations developed in response the venue itself and let us know your thoughts on the building and its future. At this venue you can also find updates and information about Creative Network's Art Trail, including where to find the street art around the town. The Old Police Station can be found close to the harbor, opposite the entrance to Castle Rushen.